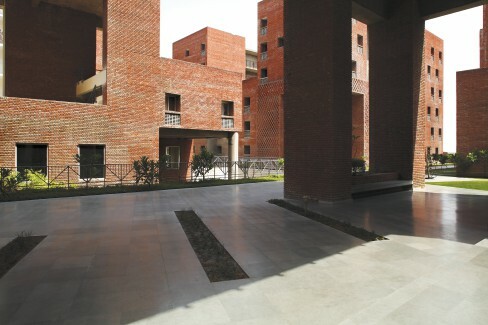 Taking a cue from the urban structure of the old settlement of Shahjahanabad, the student housing complex of IILM is organised from part to whole as court, cluster and street, resulting in the creation of a mini, sustainable cityscape within the existing campus. 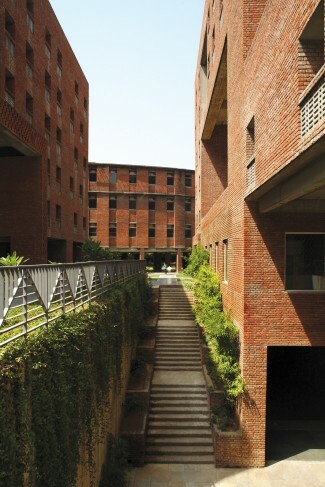 Landscaping is used to create well-shaded walkways as well as to highlight the entrance to the hostel block. “The aim was to create an architecture, using sustainable materials that would be a socio-cultural setting for fostering cross-pollination of ideologies in young minds,” says the design team at Morphogenesis. The 8-acre property in Greater Noida has been approached with the idea of a grid-like street pattern from which the volumes of different blocks have been generated. 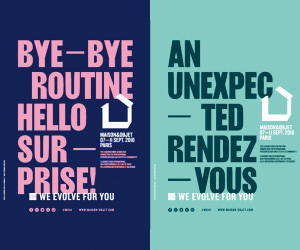 “The street is an urban space and the community its caretaker,” shares the team. All movement has been aligned along one main street, with individual blocks looking into this primary circulatory spine. Secondary and tertiary roadways branch out from here. The mass along the horizontal grid blocks southwestern winds, while maintaining a connection with the existing building. The mass along the vertical grid enables the inflow of southeastern monsoon winds. An orientation towards the north coupled with deep recessed windows provides maximum shade, adequate glare-free daylight and cross ventilation. Developed by dividing the mass into modules over a 3x3x6 grid, the building mass is an efficiently functioning composition of solids and voids. Courtyards and terrace gardens of varying scales and configurations, as well as strategically located circulation cores carve their way out of the enveloping volume. An inward-looking concept ensures that all rooms open out to the courtyards, while a largely opaque façade is presented to the outside. All movement has been aligned along one main street, with individual blocks looking into this primary circulation spine. “Owing to the extreme climatic conditions, we employed a carefully devised and comprehensive environmental strategy to protect the building and its occupants.” An orientation towards the north coupled with deep recessed windows provides maximum shade, adequate glare-free daylight and cross ventilation. With the help of water bodies, a micro climate is generated within the courtyards, and subsequently the cooling of air. A compact built form minimises heat gain. Brick jaali facades designed as per daylight analysis act as insulators and light filters to modulate indoor conditions. Further, the movement of the sun overhead adds a dynamic dimension of light and shadow patterns to the interior spaces. The landscaping intent works in tandem with the facades and courtyards to create a habitable micro climate that is environment friendly and energy efficient. Rows of thick foliage trees cut the direct sunlight in the summer, while funneling prevailing winds. Further, the vegetation emphasises the visual barrier between the existing old building and the newly built addition. 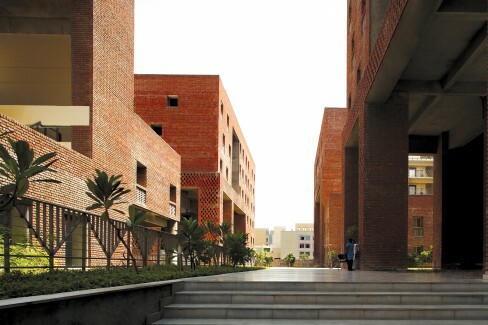 Landscaping is used to create well-shaded walkways as well as to highlight the entrance to the hostel block. Indoor gathering spaces located below ground level open to large earth-banked subterranean courtyards. 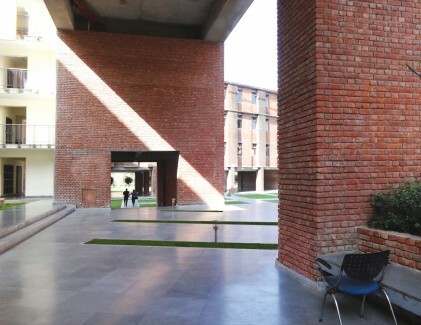 Here, strategically located water bodies generate an evaporative cooling effect, while seating spaces enhance usability. 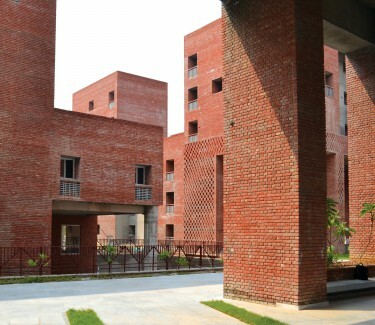 The student housing complex of IILM is organised from part to whole as court, cluster and street. Some more sustainable features include south facing solar panels on each terrace maximising on the sun’s rays. In addition, waste water is treated via a sewage treatment plant in the basement, and reused for flushing of toilets, gardening and refilling of water bodies. A rainwater harvesting system re-circulates surface runoff from the terraces while the water collected on the ground is discharged into the municipal storm water drain. A De-centralised solar water heating system is used to fulfill 100% of the hot water requirement. 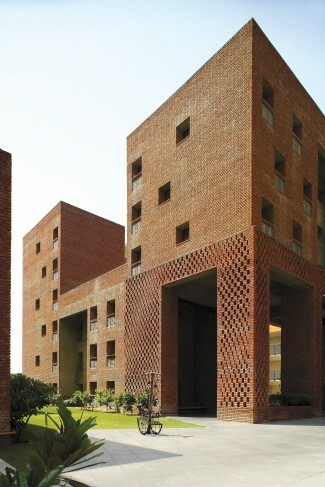 A key decision was made by the architects to employ brick as the primary facade material. “This was part of an exercise in resource optimisation, which served the dual purpose of creating a high performance and low maintenance facade that would weather well in the harsh composite climate,” says the team. Traditional brick construction forms an integral part of the history of the region. Further, it is a material that the design of educational institutions identifies with. The landscaping intent works in tandem with the facades and courtyards to create a habitable micro climate. A simple and efficient planning system, optimisation of material resources, and implementation of relevant sustainable practices have resulted in an architecture that allows for a reduced built-up area without compromising on functionality. Celebrating 20 years of being at the forefront of Indian architecture, Morphogenesis is the first Indian practice to feature in Images’ Master Architect Series. Launched globally at the Frankfurt Book Fair in October2016, the firm’s first monograph – Morphogenesis: The Indian Perspective | The Global Context – released in India early in March 2017.